Spanish manufacturer of fans FARO Barcelona proudly look back on many years of experience in the ventilation and lighting industry. The ceiling fan product line includes models varying in size from 76 cm to 213 cm, with and without (LED) lighting and various materials. But they all have one thing in common: high quality and the unique distinctive FARO design. Are you ready to take virtual trip to Faro’s head office at the Mediterranean Sea? Dive into the world of FARO Barcelona! 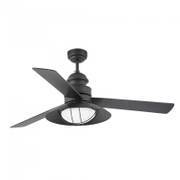 A typical example for the well-engineered FARO product line is the ceiling fan Palao. The practical fan is available in 5 colours and suitable for rooms with up to 12 m2 thanks to a diameter of 76 cm (30 inch). It comes with a handy pull cord that lets users select one of the three fan speeds. A slide switch is located directly on the motor housing which is flipped to change from summer to the energy-saving winder mode. FARO grants you 15 years warranty on the powerful motor with up to 220 revolutions per minute! What makes FARO Barcelona products so special? Stainless metals, elegant housing colours such as matt nickel and steel grey, first-class lacquered timber and passion right down to the smallest detail – FARO products are durable and continue to amaze with sophisticated design even after years of use. That is no coincidence, but rather the result of more than 30 years of experience with overseas production facilities. Before the products are finally supplied to the end consumer, they need to pass various test procedures in consideration of currently effective standards. In the course of the fundamental change in the lighting industry, FARO naturally also offers fans with integrated LED lighting. The lamps are usually covered by glass shade and seamlessly transition into the housing. What do you think of when you hear Barcelona? Bright colours, the exciting Gaudí mosaic at Park Güell, the shopping street La Rambla? Barcelona is famous for its vibrant hustle and bustle. The radiance of this diverse city inspires the numerous designers that are working for FARO Barcelona. In every corner of the city they enjoy the art of life, culture, architecture and a lively cultural exchange with travelers from all over the world and newly arrived artists. There is always something new to see and discover, and this very essence inures to the benefit of FARO’s designs. In order to stay strong in the future and on the international market, the company also organizes creative “laboratories” and possibilities for team projects within the firm. FARO ceiling fans are so much more than just everyday objects, they have their own visible character! Elegant base and pure colours are in the foreground. Models receive their individual touch from softly rounded or pointed blades, matt finishes or eye-catching wood grain. Extravagant models such as the Cuba with leaf-shaped blades, Faretto transparent or the eccentric Paxos are playful and timeless at the same time – just right for your living room? The FARO product range is always optimised with more innovative ideas, based on comprehensive experience of the past years. The business itself seeks orientation from different and constantly changing styles that can be found on the market for lighting technology. The fundamental goal – improving the own products every single day – is likely to be a decisive factor in the success of the company. To reach this goal, FARO emphasizes efficient technology and new resources. Aiming for top customer satisfaction, diverse models, quality and design, the FARO brand has become a constant in Europe’s lighting and ventilation industry. The extensive fan product range plays an important role, after all FARO ceiling fans are a convenient and decorative way to climatise the home while going easy on budget and environment. Calle Dinámica, número 1 (English: Dynamic Street, Number 1) … The head office of FARO Barcelona goes well with the vision of the Spanish lamp and fan manufacturer: dynamically following trends on the market, becoming the number 1 in the industry – clearly a business objective! FARO is a medium-sized Spanish family-owned business. Its history goes back as far as 60 years: Carlos Lopez Lopez, the company’s found and father of the current FARO CEO, started building desk lamps from all available materials in 1945. Three employees supported him in making his vision come true. Sales started soon after and in 1951 the FARO brand was created. Until today the products are sold by this brand. In 1969, Lopez‘ eighteen-year-old Carlos Lopez Orejudo entered his family’s company. By 1982 he had already gained enough experience to lead FARO through an economically difficult time in Spanish history, functioning as its new CEO. He decided to relocate the production process to China. His trips to Hong Kong and other cities soon allowed him importing Asian lamps that he wanted to use for his own company. At that time the Eastern market was not yet developed as much as it is today, so that international trade was still a bit risky. Particularly as Mr Lopez Orejudo was very much aware of the faltering situation in his own country, this step took a lot of courage. There was a lot at stake for his family as well as his employees. However just a few years later it became clear that this was indeed the right decision after all. Even back in 1988 the company was an acknowledged as a pioneer of the import of ceiling fans in Spain and fully recovered. At that time there were only a handful of other businesses that specialised in ceiling fans, FARO became a household name. This resulted in an expansion of the business premises to 600 m2 and recruitment of a seven-member team. In 1991 the continuous growth required another relocation in Greater Barcelona. The team of now 12 had an area of 1,200 m2 at their disposal which gave a lot of room for development. At the turn of the millennium in 2000 the former CEO Carlos Marti began exporting the FARO product line and opened the French market. This bestowed another 40 people and 3,000 m2 upon the company. Unfortunately, Mr Marti passed away in 2003. His position was given to Xavier Martin Cornillas, he lead his precursor’s business heritage into this day and age. A product range with outdoor and indoor devices as well as technical lighting are due to him. Furthermore, Mr Martin Conillas made an important strategic decision for FARO: Instead of focussing on easily accessible goods that are no different from other standard goods, Mr Cornillas chose to emphasise original, unique design. Products with patented design were integrated into the product line, making it stand out from competitors‘ products. These articles with the seal of approval “Design by FARO are created by employed product developers as well as external Spanish designs that are cooperating closely with the business. In 2007 another expansion followed: A warehouse with 10,000 m2, office space with 1,000 m2 and a showroom with the same size were set up. At the moment the team comprises more than 60 people and as of 2016 about 80 employees with different backgrounds work for the company. This progress in mind it is no wonder that FARO is represented in 12 countries all around the globe by now. Nevertheless, nobody wants to rest on their laurels at FARO, the business aims for a position as Global Player on the market for lighting and ventilation technology. International presence and custom-tailored solutions for the requirements in each invidual country are to be helpful. We wish FARO Barcelona all the best for a successful future and look forward to many years of co-operation.